Make your travel to Marmaris unforgettable. Enjoy a contact with nature; learn how to take care of the environment, and the best, share with your family members a great time in the Marmaris Dolphin Park with a dolphin. This is a great way to make your holidays in Marmaris unforgettable! Visit our open water dolphin park and see the dolphins, get a chance to learn about their behavior while watching interactive swim and meet programs. Take some memorable photos. Make a nice memorable excursion to get more ideas about these nice creatures. Last but not least, observe some of the dolphin’s most distinctive natural behaviors, including a spectacular jump and the unique whistling and clicking sounds they use to communicate with each other. It should be on your #bucketlist : #swimwithdolphins is a great opportunity to feel these powerful but gentle creatures in their own element. Enjoy an breathtaking dolphin ride in Marmaris. This program gives our guests the amazing chance to interact with dolphins in the water, spend time swimming and playing with the dolphins, and then let these wonderful marine mammals take you for a ride you will never forget! Kiss from our dolphins is a must as well. This excursion in Marmaris with excellent pictures will haunt your feelings long time! Come with your family and children and have a great interaction with a dolphin. Create an unforgettable memory of your trip to Marmaris. Our meet the dolphin program is a must for smaller children. If you would like to show your children the wonders of the marine world, is the ideal gift. This experience is as magical as educational at the same time. 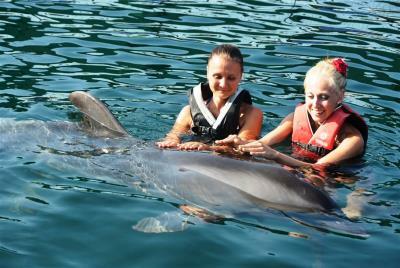 Surrounded by these gentle hosts, you child will enjoy games and activities with our dolphins. This program is inspiring and great for families with infants or little kids, seniors and people that don’t know how to swim or have swimming difficulties. 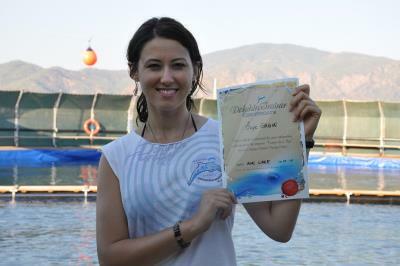 This extraordinary, hands-on program is carried out in the SAFE FLOATING PLATAFORM, which offers you a fantastic opportunity to get in touch with a dolphin, sharing an affectionate kiss to seal a long lasting emotional connection! This is a friendly experience for the whole family and will delight every family member. Book your experience and surprise yourself with the magic of the dolphins. Our platforms are specially designed so that you’re able to meet the dolphins and witness their behaviors; they’ll swim up to you and greet you with a thrilling experience. Both interactive programs include single and groupal activities. All activities in this recreational program are designed to give to the participants the time to enjoy being close to a dolphin, learn how to take care of the dolphins and the ocean and have a lot of fun in the water.